“There is a need for colleges, universities, government agencies and public institutions to have an organized vehicle to promote excellence in design, construction and maintenance of all forms of vertical transportation. ELEVATOR U is a voluntary association of individuals the purposes of which are exclusively charitable and educational. 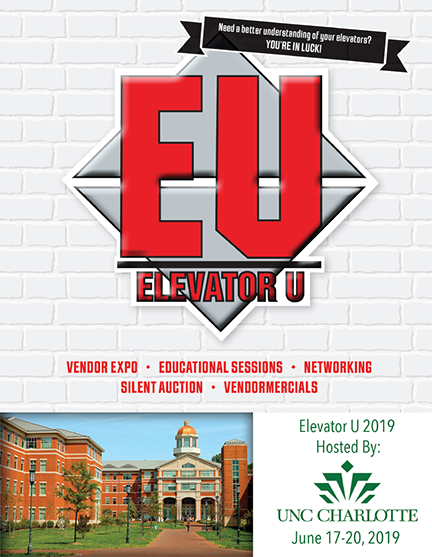 Video/Photos are from the 2018 Elevator U Conference Hosted by the University of Alabama. There are two great ways to become a member! Register and attend our yearly EU Conference or if you can't make it simply join for $100! Click on the .pdf links below to download and view the 2019 Conference Agenda and booklet which provides an excellent opportunity to learn what our annual conferences are all about. Please note that our website has changed. If you plan on attending the EU Conference this year you first must register for the conference and then click here if you'd like to pay for golf, sponsor the event or sign up for a vendor-mercial spot. Conference Attendee - Extra Booth Worker - Vendor/Exhibitor Membership - $130.00 (USD) Bundle (unlimited) Subscription period: 1 year, on: July 1st No automatically recurring payments This option is for those who have purchased an exhibit space and have an extra worker attending the Expo to work the booth. Conference Attendee - Professional Membership - $300.00 (USD) Subscription period: 1 year, on: July 1st No automatically recurring payments Attend this years EU Conference as a college, university, institution and you will automatically become a member of Elevator U. Choose this option if you plan on attending the EU Conference. Conference Attendee - Vendor/Exhibitor Membership - $1,000.00 (USD) Subscription period: 1 year, on: July 1st No automatically recurring payments If you're a vendor and want to secure a booth for the upcoming June EU Conference please select this option. By coming to the conference and exhibiting you'll automatically become a member of Elevator U. Year starts July 1st and ends June 30th prorated memberships are not available.